You want to remain an artist....not a production assembly line worker. Follow your heart on this one. I've recently gone through and designed a few completely new bears for me (and Feazel's the only one to go public thusfar). Feazel's public response was overwhelmingly positive, but what surprised me even moreso was my husband who meets and greets every bear I make. When I showed him "Feazel" he said it was nice, but he liked my other normal bears better. Now to me, that was a shock! My hubby has a teddy bear preference?? Hmmm....I need to take note. I am just a collector, but speaking from a collector's point of view, I say you should go for it. Maybe present a couple of new pieces at the same time that you present your signature bears. That way, collectors who prefer your current pieces won't become alarmed and think you are completely changing, but collectors that are ready to move on and experience new ideas with you have that option. Speaking for myself, my bear collection is extremely varied, ranging from traditional bears to very different. I don't currently have any of your current bears and would love to own one someday, but would be equally excited to see what else can come from your imagination! Patty, welcome to Teddy Talk. You aren't 'just' a collector - you're a tremendously important part of our teddy bear family. Your feedback is vital to artists, in my opinion, so please feel free to comment any time. And, Jenny, I totally agree - go wherever your imagination takes you. Very interesting points raised. I make to sell. I get a massive buzz from someone saying 'wow I would like to spend my hard earned cash because I want that bear'. So my bears are geared to what I think my collectors might like. When I have time (not at the moment) I like to try different things some are liked, others not. Then of course if someone does buy one of my bears, the cash comes in very handy! Its a lovely coming together, I enjoy making them, hopefully people enjoy having them and I'm rewarded with a good feeling and extra cash to make life more fun and for treats. Saying that a few months ago I think I went through major thoughts about my style of bears, it was pretty messy in my head! I got to a better place in the end. Good luck to all of you, I bet this topic will be on a few people's minds. Wow, a lot of people seem to be going through some changes at the moment - maybe there is something in the air! As an artist who always keeps changing her style, I would say go with a new direction, if that is where your heart leads you. If you end up just making the same thing because it sells, you will never know what else you might have achieved. Yes, it is safe, but also probably the fastest way to fall out of love with making bears completely! An artist needs to challenge themself and be always looking to improve and develop their work. I would agree that sound advice would be to keep your 'bread and butter' bears going while you develop your new direction, and introduce them gradually. But, honestly, I think you have to explore these new ideas if that is where you are wanting to go. I get a lot of comments from collectors that they like my bears precisely because I change and evolve my style - in fact, I have several styles, from traditional, through sculpted bears, to miniatures, but people always say they can tell they are Christine Pike bears. So long as you stay true to your own artistic values, any time spent on experimentation will be worth while. It's funny really because when I first posted this thread I was questioning everything..and to be honest, since I started making bears 6 years ago I have changed my style hugely really. I have made many different types of bears..and cats, rabbits..., big bears,miniatures..open mouthed bears..old fashioned bears...bent leged bears..beasr with necks..without necks. Tried loads of techniques and styles. It has all been a journey that I have enjoyed immensely. I don't just do it for the money...but I have to make a living from it. If I wanted to do something that made me lots of money I would go back in that salon 5 days a week and earn a small fortune. Not that I don't love hairdressing either..I'd be a hairdresser again in a heartbeat. It's earned me a great living, taught me about life and every day has been filled with problems, challenges, humour, creativity, camaraderie, hard work and great gossip. I could not have asked for more..I can go home at night and rest easy..and forget about it till next day. But after 34 years I have had enough of standing up all day, every day. I make bears because it is the only thing I know that gives me a huge tingly feeling every time I make a creation that I am really proud of..and that keeps me up all hours because I can't wait to finish a bear..or gets me up early because I can't wait to start one. So that's why I keep striving for new things to inspire me..and drive me forward ...that will never change. Patty...without collectors like you there would be no point for me..because part of the pleasure of creating the bears that I do is having someone who is delighted to be adopting them. And I'd like to add my welcome too Patty! I have to agree - you are NOT "just" a collector. Without collectors we all would be JUST people with an expensive hobby! I have to agree - you are NOT "just" a collector. Without collectors we all would be JUST people with an expensive hobby! AMEN! Welcome, Patty!!!! :hug: Your opinion is as valuable as an artists! Thank you for sharing your thoughts... you seem to have solidified what we were all thinking on this subject. Don't be afraid to chime in anytime! Hi MaryAnn...I think what you said is very true. I like the feeling of being slightly stretched..If it's too comfortable for me then I start to think it's easy..and that isn't good for my creativity. I am taking time out now to try new things..while still doing my regular bears. I think that's the best way. You have a huge following and an incredible ability ..Knowyou could branch out and create a new look or design that will please you and your following. You have such a talent for creating a "Look/Emotion." I've learned something I should stick to my cats! Seems odd? I started out designing bears. You and I have both just finished an ebay auction. 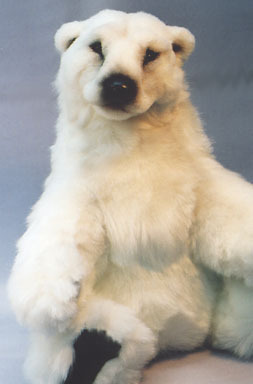 My Polar Bear received a lot of hits and the most "watchers" I've ever had, but still finished at almost 2/3 the price I would get for one of my cats. (Your bear did wonderfully, Congratulations!) I didn't think I had moved out of the bear artist category, but I think collectors are wise. I believe, at least some of my collectors, are thinking that my cats will be better collector pieces, for value, than my bears I guess this could be a valuable lesson to me. I was going to design a whole Polar Bear family which would have taken me many months of design work. Now I think I'll concentrate on new cat designs. Maybe you could call them "4 O'clock bears or AfterHours bears"? Karen I totally understand your dilemma here. What happened to you is an example of why I am exercising caution. I am running a business like you and I need to consider my customers..and as much as understand the concept of 'art for art sake' I think a balance has to be struck in terms of what sells best. Maybe people may think that means I sell my soul to the devil instead of being a poor starving artist who just does it for satisfaction and 'art' but I am trying to make a living AND get a buzz from what I do, In the main that is what happens. I have designed a new teddy bear...though of the same genre, it's very different from my signature bears and so I am eager to see how it is received. I have shown it to several trusted friends and the feedback has been very positive so far..we'll see!! I think on the whole I have got the recipe right these days. I chucked my order book out of the window a few years ago to be footloose and fancy free, I felt shackled by shop orders and commissions for bears I'd made two years ago and so now I go where the whimsy takes me making whatever I like ..when I want to and usually it sells. So I suppose in the great scheme of things it is a small price to pay that I try to work on designs that I know work for my customers as well as me..and yes...I do start at 4 am most days!!
! !Not sure if that quote is apt, but it makes sense to me! Your bears are fab and greatly desired. If you follow your heart and try different ideas you will feel fulfilled and there is every chance that your new ideas will be highly desirable. Go for it, if you don't like the end result you still have your tried and tested ideas. Have fun. Well... I have been 'experimenting' I did a panda with claws and an open mouth..and found an easier way to do the claws which I am chuffed about..and I did a puppy too. I have also altered the pattern of my bears with some success too...so far so good. I don't think though...having started to go through this loop that there is any point in leaving behind all my ground work...that would be financial suicide and a risk I am not prepared to take. Like many on TT I must make a living...or 75% of it anyway, from making bears...so I as much I occasionally throw caution to the wind..I can't just go off at tangents for arts sake when I need to pay the bills. That would be an unwise move and one I haven't the luxury of being able to afford to make.